The Wiltshire market town of Wootton Bassett is no stranger to remembrance and commemoration. Now, ‘Royal’ Wootton Bassett, paying our respects, pausing to remember, to learn and show solidarity for those who grieve or suffer is perhaps what most people know us for. So, remembrance is in the DNA of the town; evident in the recent WW1 centenary events, the war memorial, the annual Remembrance Day commemorations, the more recent repatriations through the town – it’s a feature of our community we are proud of. It allows us to come together with shared values to reflect on the past, consider the present and work to a better, safer future – to learn lessons, perhaps, reconnect and reaffirm. As the Headteacher of the towns secondary school, Royal Wootton Bassett Academy (RWBA), we are very much part of that community of memory and I am very proud that remembrance, respect and civics lie at the heart of ‘The Bassett Way’ educational experience. Upon interview one of the things that struck me about the school was its unique commitment to empowering young people to safeguard the future by learning about the past. Each year, Remembrance Day was immaculately, innovatively marked. There was a strong local military connection of course, the spontaneous community response to the repatriations of the time were attended by school staff and students. The importance afforded civics and the idea of service, community engagement and the wider world was hugely impressive. The generational divide was overcome with students providing local elderly residents with a Christmas party and sing-along, whilst the Harvest events led to students taking food parcels out to the community – so remembrance, respect and community were key, not superficial, but deeply embedded in the school’s mission and curriculum; we are a global school in a local community. I was most struck by the schools marking of Holocaust Memorial Day. 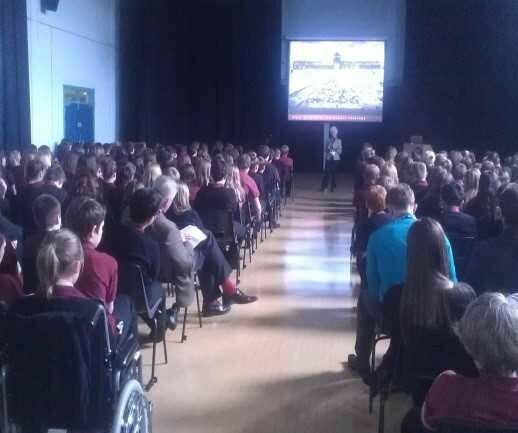 Unlike some schools, this wasn’t some tokenistic assembly, a one-off nod to Holocaust education. Rather the marking of HMD was in tune with the school’s values; it was something lived and not just laminated. RWBA has a whole school programme of Holocaust, genocide and human rights education (HGP), with its own Lead Practitioner and designated SLT link. Since 2009, the programme has coordinated aspects of the regular curriculum that speaks to these issues and themes, whilst offering stage/age appropriate materials and experiences in the ilearn and personal development programmes. It has provided enrichment and extra-curricular opportunities and always been a civic and community driven agenda that has facilitated family and community learning. It is something we are very proud of, but HMD each year provides one of the focal points for this work; it’s an opportunity to ‘join the dots’ of what has been going on across the school, a chance to engage with the community, a time to come together and recommit to the values of learning from genocide for a better, safer, future. In 2012 our school became a UCL Centre for Holocaust Education ‘Beacon School’. This recognised our existing commitment to Holocaust education, but also moved our practice forward significantly. It’s made a huge difference to our school, helped us retain staff, engage with research, forge new partnerships, and brought numerous benefits, new and enriching experiences to our students – we have so much evidence of its impact – and the relationship with UCL and the Centre has been fabulous. But HMD renews this commitment annually. Beacon School status lies with the ‘school’, not with a single committed lead teacher, and so every year as we come together to mark HMD it is an opportunity to ensure the whole school community is involved and aware. HMD gives students, staff, parent and the wider community a great sense of pride in our identity as a UCL Beacon School and as a result, our students, staff, governors and parental body are aware of our work in Holocaust and genocide education, reaffirm their support and value it – they feel part of it and are invested. Each year HMD provides that impetus and reminder, and this year it couldn’t be more resonant with its ‘Torn from Home’ theme. When we became a Beacon School I felt it important that to lead I should do the Holocaust training. There was so much about that ‘Unpacking the Holocaust’ CPD day that was powerful and transformative. Writing this I am reminded of Leon Greenman and his family being ‘Torn from Home’ and of what ‘home’ meant after Leon’s liberation. If you haven’t done the session you must – it raises so many questions, heartbreakingly informing about the specificity of the Holocaust, but also of the relevance and traces so prevalent in our world today. In the same session I learned about Anka Bergman, who – having survived Terezin, Auschwitz and even giving birth at Mauthausen – returned home to Prague to darkness and ‘‘…there it hit you. That you came back to nothing.” To commemorate and educate about that reality, that experience, is surely what HMD and being a Beacon School is all about. Of course, to then have Eva Clarke, the baby Anka astonishingly gave birth to at Mauthausen speak at your school and share in our HMD is extraordinary. HMD can enable Beacon Schools to shine and flourish, providing a platform to bring their year-round efforts to the fore. But, as the BCC reports this week remind us – being ‘Torn from Home’ is not a historical footnote – it’s a lived reality for so many today. As I write, the UNCHR fears about 170 migrants have died in the Mediterranean, and there is ongoing concern for the wellbeing of the Rohinga ‘Torn from Home’ in Myanmar and the fate of other groups around the world. In my own school are some young people for whom the theme is deeply personal – this is not simply academics, but about values and rights, about identity, belonging and what it is to be human. This year’s theme, as often HMD annual themes do, provides a mirror to the present as much as it does the past: together, marking HMD and our Beacon School status has become a vital pillar of our safeguarding strategy. Holocaust education helps reinforce issues of not standing by. It helps us celebrate and identify opportunities for community cohesion, and in this year’s theme we have been able to explore British values – by exploring ‘Torn from Home’ case studies within British responses to the Holocaust. Tutors have reported that students are more accepting, tolerant and open-minded, more respectful, empathetic and inclusive. This is especially important for a largely monocultural school and for our efforts to ensure students are outward facing and prepared to engage in an international context. Without doubt it has contributed significantly to our RE/SMSC provision and expertise. For me as Head, I want academic excellence and holistic experiences for my students. I want young people leaving RWBA to be informed, engaged, inspired and empowered, equipped to be empathetic and active global citizens who can give to society. Being a Beacon School and marking HMD2019 is a key part of that, a truly embedded and valued part of the ‘Bassett Way’. If you are truly, and authentically, leading and playing your part this HMD then I would expect fellow school leaders to be exploring the ‘Torn from Home’, its historical context and contemporary relevance, in rich, innovative and meaningful ways – beyond leading assemblies or welcoming survivor or guest speakers. Here at RWBA, year on year, our staff embrace HMD and this year is no exception. We have bespoke year group activities that take place in our ilearn programme and these include specific challenges that enable students to creatively demonstrate their understanding in storyboards, google-doodles, acrostic poetry, life maps, short stories and visual hexagons. Non- specialist teachers from across the Academy contribute and actively engage. I think, when HMD is endorsed with strong SLT leadership your whole school Holocaust education takes off, where cross curricular or interdisciplinary approaches can flourish; I am especially interested to see what colleagues will be doing with Ossi’s story from the Timeline activity as his family, and indeed all Roma, being forced to remain static is in a sense a different ‘Torn from Home’ that speaks powerfully to our traveller community. The training we have benefitted from as a UCL Beacon School has also shaped the quality of our HMD provision. It’s approach focuses upon developing an enquiring mind, questioning and building resilience and criticality which I think is massively, massively powerful. The surviving survival sessions are extraordinary in that regard and have influenced our HMD2019 thinking as well as feature in the upcoming Year 9 Holocaust Day. We have a staff here who will just go for it, and our whole staff love it, are proud of it, and have developed as better teachers for it. My staff are equipped to explore controversial, challenging or sensitive issues because the training and support has given colleagues confidence, skills and tool-kit they can apply – whether in exploring the emotive Leon and Anka’s Holocaust homecoming or tackling contemporary stereotypes of refugees and reflecting on Faiza’s story. This years’ ‘Torn from Home’ theme has resonated with staff and students alike. The one thing that I would say to fellow schools’ leaders this HMD or who are considering applying to become ‘Beacon Schools’, is to absolutely go for it! Go with it, support it in every way you can. Be seen to absolutely, overtly support commemoration and educational opportunities in your school and communities. Make sure your leadership team are on board. If as Head you can’t get to an event or classroom, you make damn sure someone else from SLT is there, but I think overtly supporting it, try to be part of it, to show the students and staff that you’re interested, that the subject matter is important, that both from a curriculum and holistic perspective its valued in your schools. But more than that, I would really urge you to be the outward face of local Holocaust Memorial Day commemorations, to lead by example and champion this work with your parents, staff, governors and community. I truly feel marking HMD2019 is a school leaders moral and educational imperative, it contributes so much to a school community and its outcomes are so often so valuable and unexpected. Go for it! 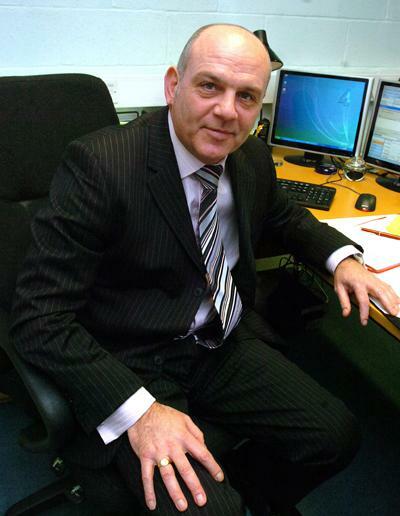 George Croxford is Headteacher at Royal Wootton Bassett Academy and CEO of the RWBATrust. He is a long-standing supporter of the Centre’s work and is proud to lead a UCL ‘Quality Mark’ Beacon School.